During a meeting in Kyiv, President of Ukraine Petro Poroshenko and President of the National Council of Austria Wolfgang Sobotka, have noted the intensity of the political dialogue at the highest level and expressed mutual interest in deepening inter-parliamentary ties. 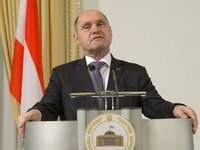 "The principled position of Austria during the presidency of the EU Council on the extension of sanctions against Russia in response to the blocking of the peace process in Donbas by Moscow, the continued occupation of the Crimean peninsula and another act of armed aggression in the Black Sea and the Kerch Strait, was noted," the presidential press service said on Wednesday morning. The head of the Ukrainian state noted Austria's vigorous efforts to help improve the humanitarian situation in areas liberated from the Russian occupation forces. "Special attention was paid to the issue of the release of Ukrainian hostages and military personnel of the Ukrainian Navy, who are illegally detained in Russian prisons," the information says. They also discussed the risks to the energy security of the European Union, which are created by the implementation of the Nord Stream 2 gas pipeline.